Over the years my guitars have converged into three major areas. The first are the Reynolds Series classical guitars, which are the culmination of my studies, research and years of design improvements. The second are Homage Series classical guitars, which represent my interpretations of famous luthiers' classical and flamenco guitars. Finally many of my clients have encouraged the development of a steel string Fingerstyle Series with similar design philosophies which I hold with my classical line. The following models represent the developments that I have worked on over the past fifteen years. I feel they reflect the best combination of tradition and contemporary innovation to be found in luthiery today. This concert guitar is the most popular of my designs and has a beautiful rich sound especially when ordered with the optional double top soundboard. The instrument features the characteristic Reynolds headstock shape, special rosettes, low profile elevated neck and optional hand carved acoustic port. The acoustic port allows the player to hear more of the guitar and to broaden the tone palette. I have been making the Grand Legacy as a Double Top guitar since early 2001 and have a lot of development experience with this groundbreaking improvement in the classical guitar. An all out effort to produce a new sound for the guitar. The bracing is my version of the famous and controversial design from Dr. Michael Kasha and is based in practical acoustic research and experimentation. The sound is very piano like with beautiful sustain and clear voicing from each string. The Concert Grand is a very powerful guitar while the offset soundhole provides the same effect for the player as an acoustic port and also deepens the overall tone production. This design has been in my line since 1997 and offers important distinction for the concert player. My most innovative guitar featuring a Double Top soundboard with special bracing , Doubled Sides and a Double Back with tunable Acoustic Port. The back needs very little back bracing or kerfing as it is twice as thick as a normal back and is extremely stiff. This is a huge sounding guitar for the Concert Musician. Standard with Master Grade Brazilian Rosewood, Rodgers or Graf tuners and Calton or Bam case. This is a new concert level instrument in terms of tone production and playability with important economical advantages to help the conservatory student acquire a concert level guitar in times of low student loan availability. I use Master Grade East Indian Rosewood that has been in my inventory for over 10 years as well as aged, seasoned soundboard woods in Cedar or Spruce. The internal structure and bracings are identical to my top of the line concert guitars. I can offer this instrument for a value price by simplifying several features involved with the "furniture making" aspects of guitarmaking and by producing the Conservatory in batches of three. I intend to keep this guitar in stock and it is not available for custom orders. This guitar is identical to my Grand Legacy design except that it is constructed entirely from American woods. It has been a longtime desire of mine to build an instrument with sustainable non-endangered woods from my country. It took a bit of research but the results are very gratifying with concert quality sound and a refreshing new clean look. The Homage series of guitars are based on the works of famous makers which lay the foundation for the modern classical guitar. These instruments are faithful representations while still benefiting from Reynolds techniques and design cues which combine to bring an unsurpassed interpretation of classic instruments. I have built several guitars in the style of the famous makers including Santos, Torres and Fleta. 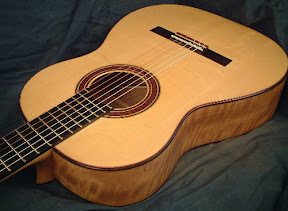 Here is my bench copy of the most recognized classical guitar ever, the one Segovia called "The guitar of our epoch". This instrument can be ordered with as deep a reproduction as desired including authentic rosette and purflings or with a double top soundboard for a wonderfully even tone production that my double tops are noted for. I have used the book documenting the famous 1937 Hauser by Richard Brune1. This authoritative work includes accurate detailed drawings and photographs made by Brune from the actual guitar now on display at the Metropolitan Museum of Modern Art in New York. 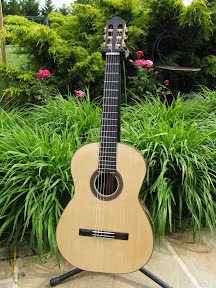 A Flamenco guitar based on a 1927 Santos Hernandez in Spanish Cypress and European Spruce. I value the beautiful, crystalline Cypress sound of the Flamenco guitar and I have made every effort to create a very loud one. Flamenco guitarists who need more power won't have to leave the traditional sound for a Rosewood guitar. This guitar complements my classical guitar as many of my clients have need of a responsive steel string guitar. 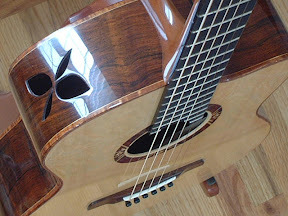 The WoodSong is a 12 fret guitar and can be ordered with an optional soft cutaway for an additional cost. The lower bout is identical to my classical shapes and should feel very comfortable. 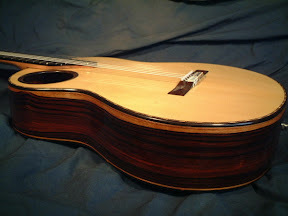 This is a well proven design that I have been making for several years and was used by Phil Volan to take second place in the 2005 National Fingerstyle Championships in Winfield. Many optional features including a Double Top and the new "post bridge" designed after work by Mike Doolin and Jeff Elliott.